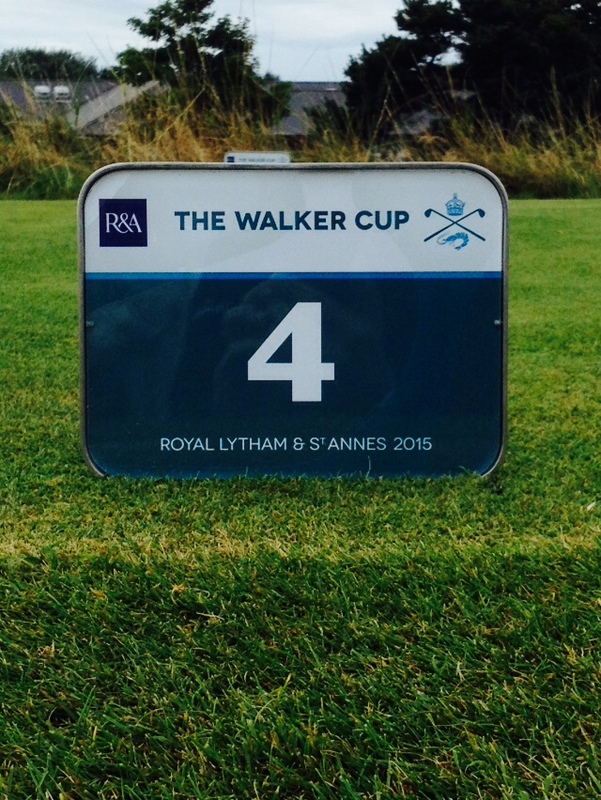 The 45th Walker Cup match starts at Royal Lytham and St. Annes Golf Club in two months time on 12th September 2015. 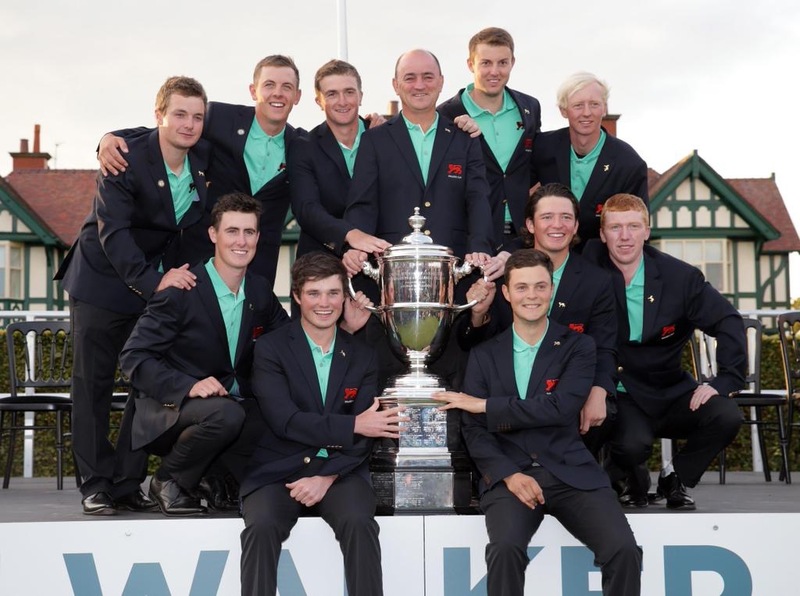 Both teams will be finalised on or around the 24th August 2015 following the completion of the US Amateur Championship at Olympia Fields CC in Illinois. Since my last GB&I Team update quite a lot has happened. 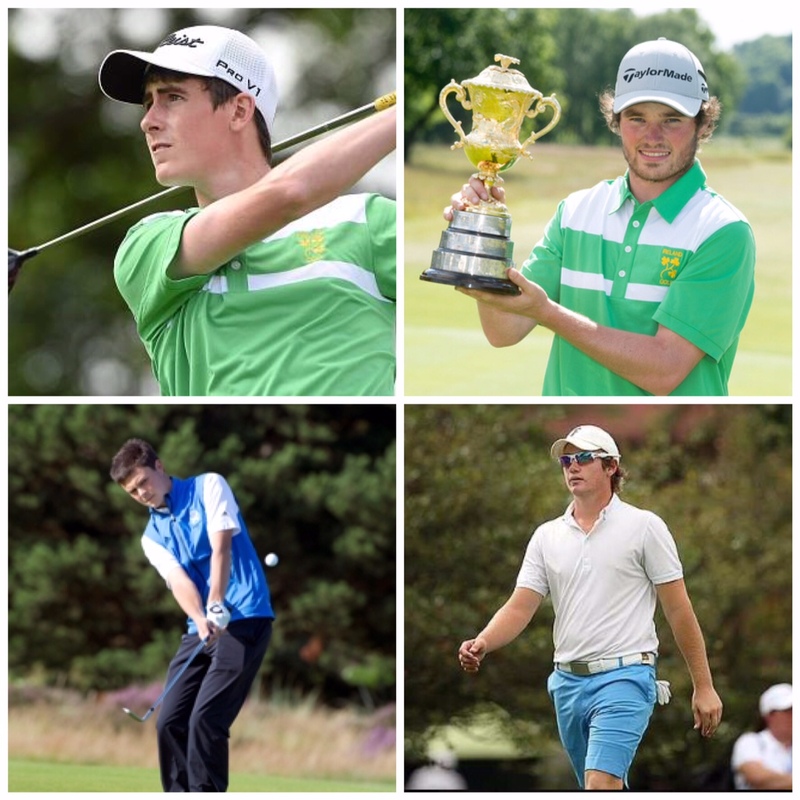 More importantly three major events have been played – The Amateur Championship, The Brabazon Trophy and this week the European Amateur Team Championships. 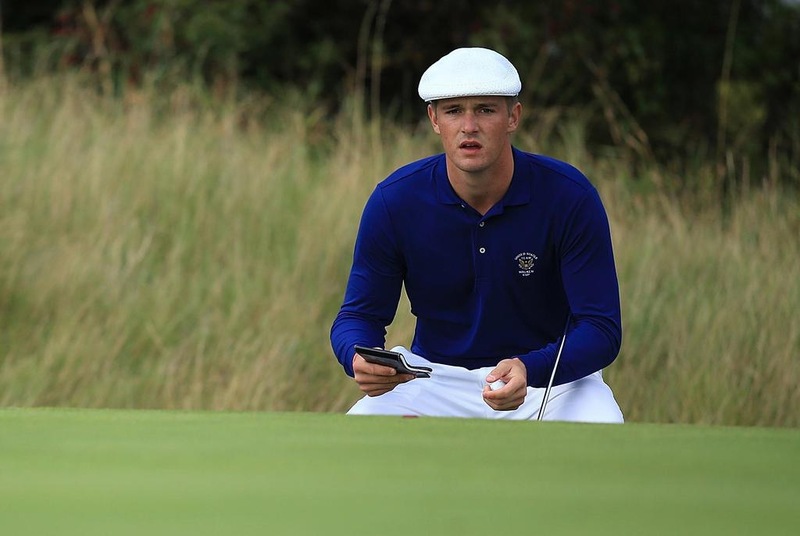 The latter – which Scotland won – are particularly important as it has seen nearly all of the main protagonists playing the same course and in some cases competing directly against each other. 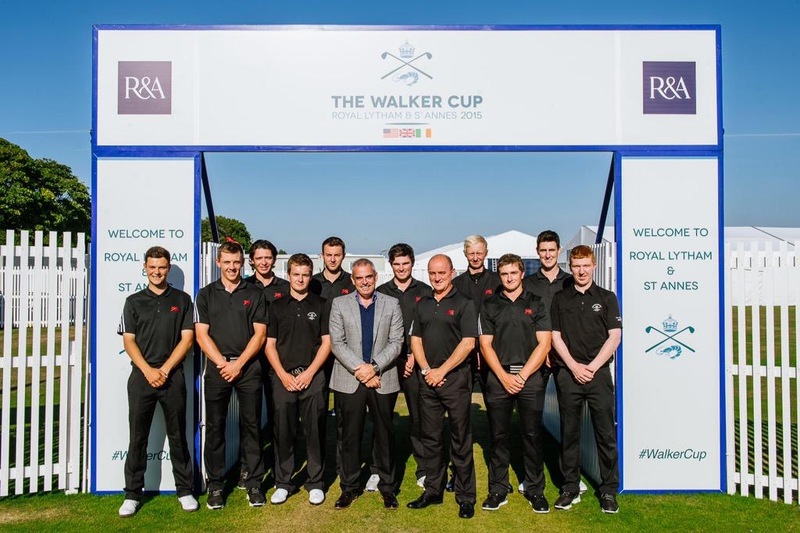 On 23rd January 2015 The R&A announced an initial 20-man GB&I Walker Cup squad. Since then three members of that squad, Paul Howard (ENG), Ben Stow (ENG) and most recently Bradley Neil (SCO) have chosen to turn Pro thus excluding themselves from this amateur match against a team from the United States. Chris Selfridge (IRE), whilst not in the initial Squad, has also turned Pro. If he had produced the form he has since shown as a Pro in the amateur ranks he may very well have been in the selection shake-up too. Rhys Pugh (WAL), who played in the 2011 and 2013 matches, has also graduated from College and turned Pro. 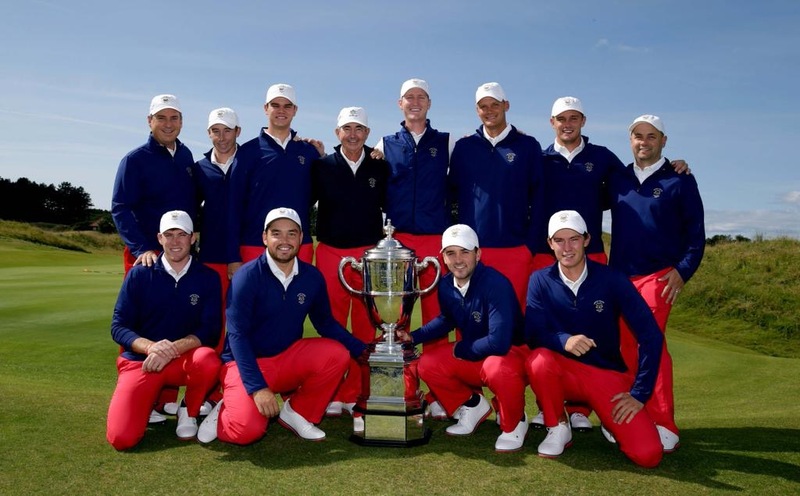 Barring miracles at the Open Championship it is unlikely that any more amateurs will turn Pro before the Walker Cup is contested. Before looking at the GB&I Team it is perhaps worth reminding ourselves of the competition’s format. A total of 26 matches will be played; singles and foursomes. Four foursomes and eight singles matches are played on the first day. On the second and final day there are again four foursome matches but there are two additional single matches, so that all team members play in the final session of the competition. The point in raising this is the foursomes angle simply can’t be ignored when picking the Team. So let’s look at the players who are available and will most likely make up the GB&I team. Inevitably as the match draws closer the 10-man GB&I team is starting to take shape. His recent qualification for the 2015 Open Championship – for the second year running winning the Woburn Final Qualifier – has capped an excellent run of recent results. A win would have been nice to see but his 5th place finish at the NCAA Division 1 National Championship, Brabazon T9 and European Team Stroke Play (SP) Qualifier T8 have all been impressive. Consistently high finishes this season – Lytham Trophy (T2), Irish Amateur (2nd) and Scottish Amateur (3rd) – culminating in a superb Brabazon Trophy victory in late June mean Cormac must have already done enough. The Englishman has been towards the top of the GB&I standings for some time now. Whilst his play at the Lytham Trophy (127th MC) was unhelpful he has generally enjoyed a fine early summer with good results at the Welsh Amateur (T2), the Amateur (last 16) and the Brabazon Trophy (T7). He also demonstrated good match play form contributing well for England against Spain at Burnham & Berrow as well as at this week’s European Team event (5 points out of a possible 6). He also plays in The Open Championship this week following last year’s successful defence of his European Amateur crown. Back from San Diego, where he ranked 84th in the Golfstat US college player rankings (2nd only to Paul Dunne in GB&I terms) for the 2014/15 season Grant delivered a superb Amateur Championship performance. He finished T7 in the SP before progressing all the way through the match play (MP) before losing 4&2 to Frenchman Romain Langasque in the Final. In the R&A’s flagship event this will surely be enough to secure his place at Lytham even before his strong contribution to Scotland’s effort at the European Amateur Team Championship (5 points out of a possible 6). As a 2013 team member – and one of the few to come away from the National Golf Links of America with some credit – Mr. Edwards will have been keen from the start to see Gavin in his 2015 team. 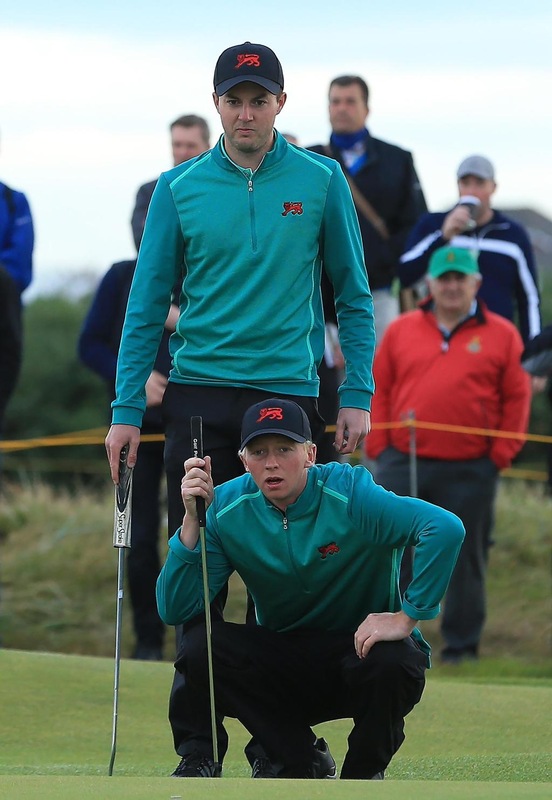 Like the thoroughbred he is Gavin has found some form at just the right time winning the Irish Amateur (albeit at Royal Dublin, a course he could play blindfolded) and following it up with two good performances at the Amateur (Last 32) and the Brabazon (2nd). A little inconsistent this year but given his Walker Cup experience he has probably done enough to be selected now. It is this match experience that places him above McDonald and Ferguson. His semi-final defeat at The Amateur on the 19th hole to the eventual champion Romain Langasque must have resonated with the selectors – it certainly did with me. Coupled with his 13th and 15th place results at the Lytham Trophy in 2014 and 2015 respectively he has made himself very selectable. He missed the Brabazon but made the cut at the conflicting Challenge Tour event in Scotland. 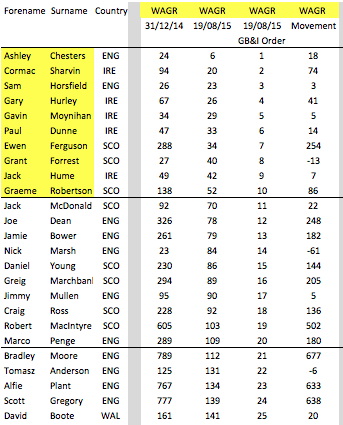 He was the highest GB&I finisher in the European Amateur Team Championship SP Qualifier (T4) and alongside Forrest largely delivered the Championship to Scotland (also delivering 5 out of 6 possible points). He appears to be sprinting through the finishing line. A two time winner this season in Scotland with consistent form behind him, including a Irish Amateur T3, Scottish Amateur T4, Amateur Championship T7 / 64s and Brabazon T11. A strong match play track record both in the Boys’ Amateur, which he won in 2013, and for Scotland means he is just about worthy of a place in my Certainties. A good finish to the season will secure his spot and no doubt a nice foursome pairing with Grant Forrest in the match itself. 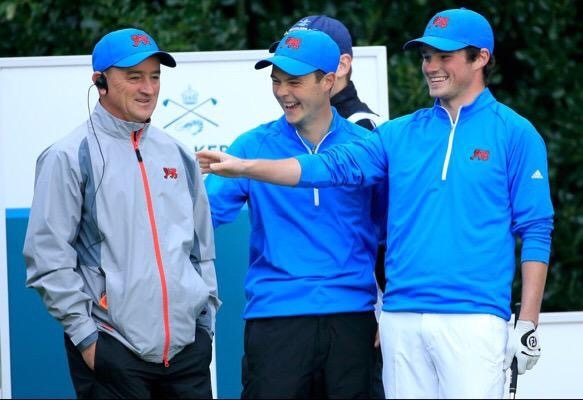 Rankings don’t tell the full story for Mr. Mullen who has an excellent MP record and is increasingly a strong proven foursomes partner for Ashley Chesters. After reaching the last 16 of the US Amateur last year he also progressed to the last 32 of the Amateur this. 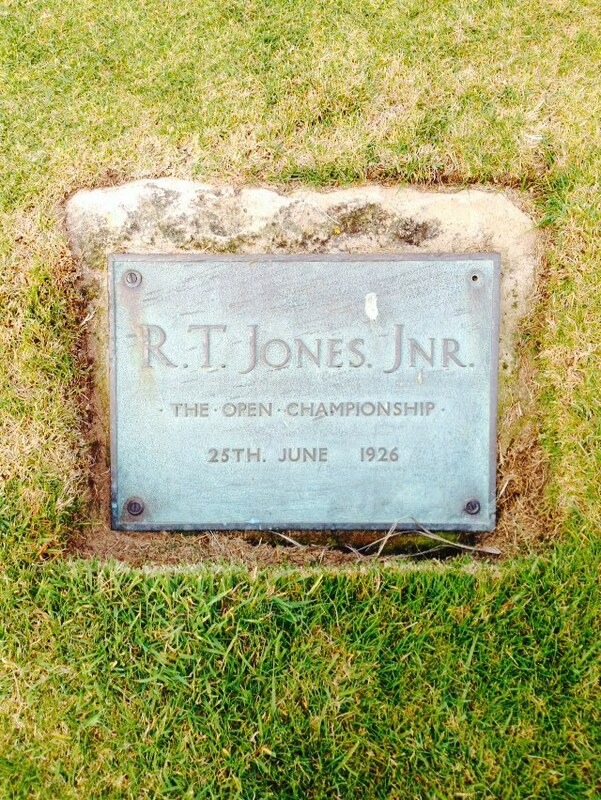 He also has a recent win to his name, the 2015 Welsh Amateur which he won by a street. If he and Chesters deliver in the Home Internationals I think he has a very good chance of being selected. Gary looked a certainty for selection after starring overseas during the winter (South African Amateur T5, Spanish International Amateur 2nd, Argentina Stroke Play T8 and Southern Cross Invitational 3rd) and then producing solid early season form back home (Lytham Trophy T19 and Irish Amateur T25). However, his / the decision to play in the Palmer Cup rather than the Amateur, as well as missing the Brabazon Trophy, has opened the door to others and appears to me to have put unnecessary pressure on his selection. He just makes it into my current Team largely on the back of his proven Foursomes partnership with Paul Dunne. Whilst he has course form with 4th and 19th places at the 2014 and 2015 Lytham Trophies he may need to help himself with a result or two in the next few weeks to stay on the Team. Ben’s strong performance in the MP stage of the NCAA Division I Nationals, where he helped his college, Louisiana State, to the Championship title closing out both the semi-final and final matches will not have been lost on the selectors. Riding a wave of confidence he has played well at both the Amateur and Brabazon, finishing T7 in both stroke play events. An impressive QF win over Cormac Sharvin at the European Team’s but followed it with a disappointing late loss to Greig Marchbank in the SF that let Scotland in. His qualification for The Open Championship gives him an opportunity to move forward again next week. His maturity and US experience may be useful to the Team too. ‘Horses for courses’ – I simply can’t get out of my head Dermot’s T7 and T10 finishes at the 2014 and 2015 Lytham Trophy events. He has also played consistently well since Lytham – Irish Amateur (5th), Brabazon Trophy (11th) and European Team (SP T8 / 2 out of 3 points in the MP). Of course he also won the West of Ireland earlier in the year. It was only at the last minute that I dropped him into Possibles from Probables when I decided to give Hurley the benefit of the doubt due to his longstanding foursomes partnership with Dunne. A much needed T6 at the St. Andrews Links Trophy followed by a T3 at The Brabazon Trophy for Hume. A bit like compatriot Hurley Jack had appeared to go off the boil a little following some strong Winter results, notably in Argentina. Only out of the Team because I am currently undecided about his foursomes partnership with Moynihan. For me he still has some work to do in the coming weeks but I still wouldn’t be surprised to see him in the Team in September. Nick has unfortunately drifted from the centre of the team photo to the periphery in recent months after looking odds on at the start of the year. A solid if unspectacular season to date with the highlights a 2nd in the West of England (at Saunton where he won last year’s English Closed Amateur) and a T4 at the Welsh Amateur. Notably lightly utilised by England at the European Team’s this week. Like Hume and McElroy Nick now needs to force his way back in in the coming weeks. How do you solve a problem like 18 year old Sam Horsfield ? Undoubtedly a hugely promising talent but beyond qualifying for the US Open last month – which in turn meant he didn’t play as originally planned in The Amateur Championship – he hasn’t frankly achieved a great deal this season, admittedly due partly to school commitments. When coupled with his lack of links experience and next to no contact with any of the other potential team members to date calls for his selection become increasingly difficult to accept. Despite being the highest ranked GB&I player in the WAGR at the time of writing (I am not sure how or why ?) his selection would be a very brave call at this point. To force his way in now he surely needs to either impress beyond believe at the forthcoming Squad weekend (which I assume he is still attending ?) 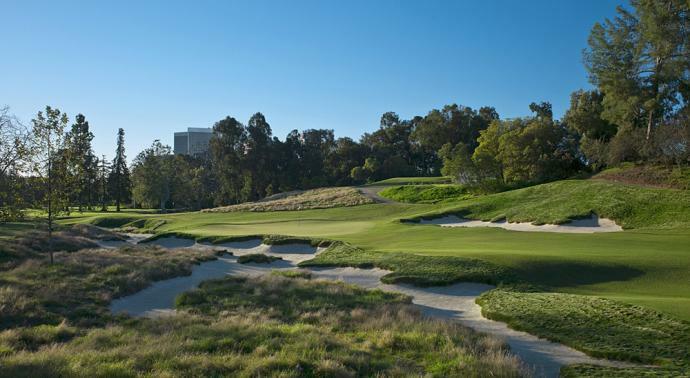 or go deep in the US Amateur. 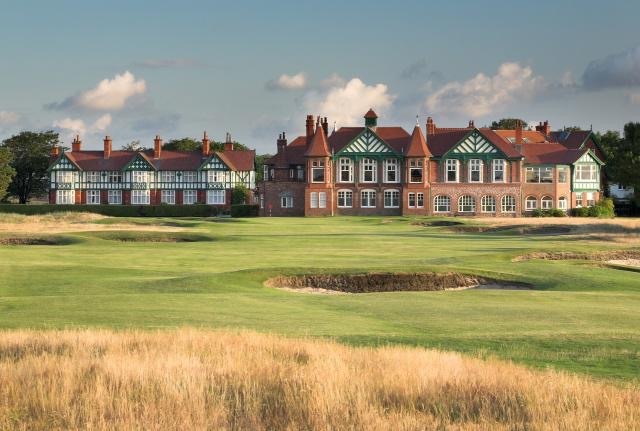 Finally, I see he has not entered the English Amateur at Alwoodley and Pannal GC’s which starts just a few days after the Lytham squad session preferring to return to the US for the Western Amateur – wherever he plays a strong result is required sooner rather than later. 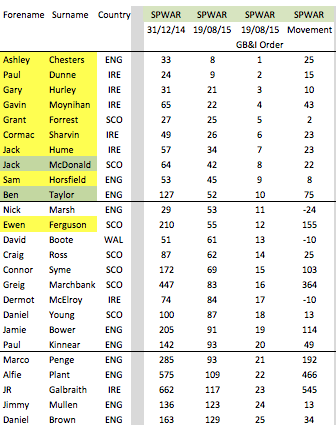 From my short list of 14 players 11 (as shown in brackets above) were in the initial Walker Cup Squad. Ferguson, McElroy and Taylor have forced their way into the shake up. To differing degrees, and perhaps a little prematurely, I believe David Boote (WAL), Jamie Savage (SCO), Tomasz Anderson (ENG), Daniel Brown (ENG), Adam Chapman (ENG) and Graeme Robertson (SCO), who were all in the Squad, have already played themselves out of, or if you prefer not sufficiently well to get in to, the final selection picture (or at least mine !). 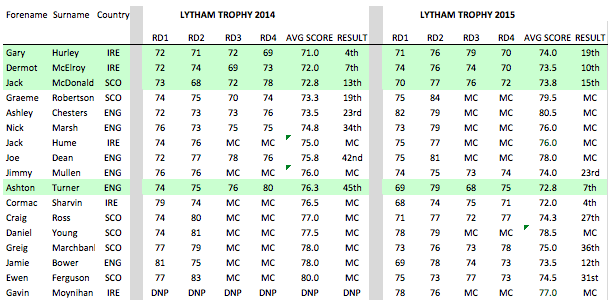 Daniel Brown finished 19th and 6th at the Lytham Trophy in 2014 and 2015 respectively so perhaps shouldn’t be completely discounted but unfortunately he hasn’t done enough elsewhere since his very good 2014 Amateur championship performance at Royal Portrush to get on the radar. 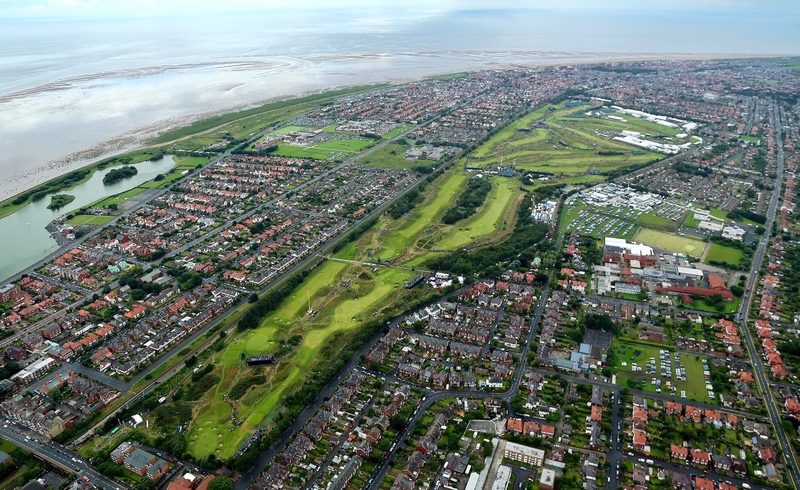 As mentioned above the Squad are formally meeting up at Lytham on 21st and 22nd July 2015. No further Squad announcements have been made since January so it will be interesting to see who actually turns up for that gathering. 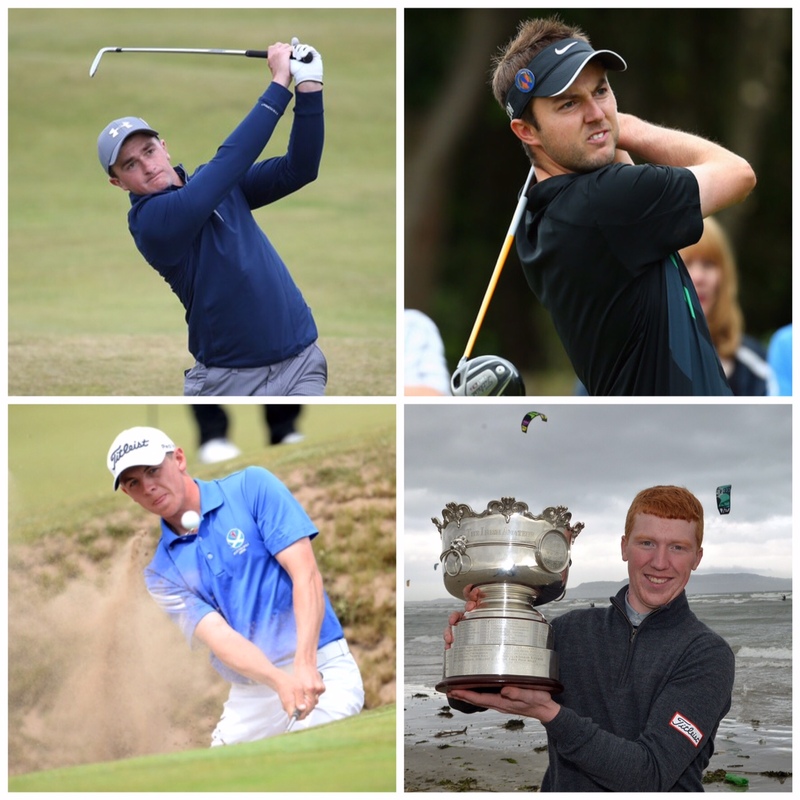 In terms of forthcoming major Championships that are still to be played and will be being watched carefully – we have the English, Scottish and Welsh Amateurs (27th July), the European Amateur (4th August), the Men’s Home Internationals (11th August) and the US Amateur (15th August). So there is still plenty of golf to be played before any decisions have to be made. 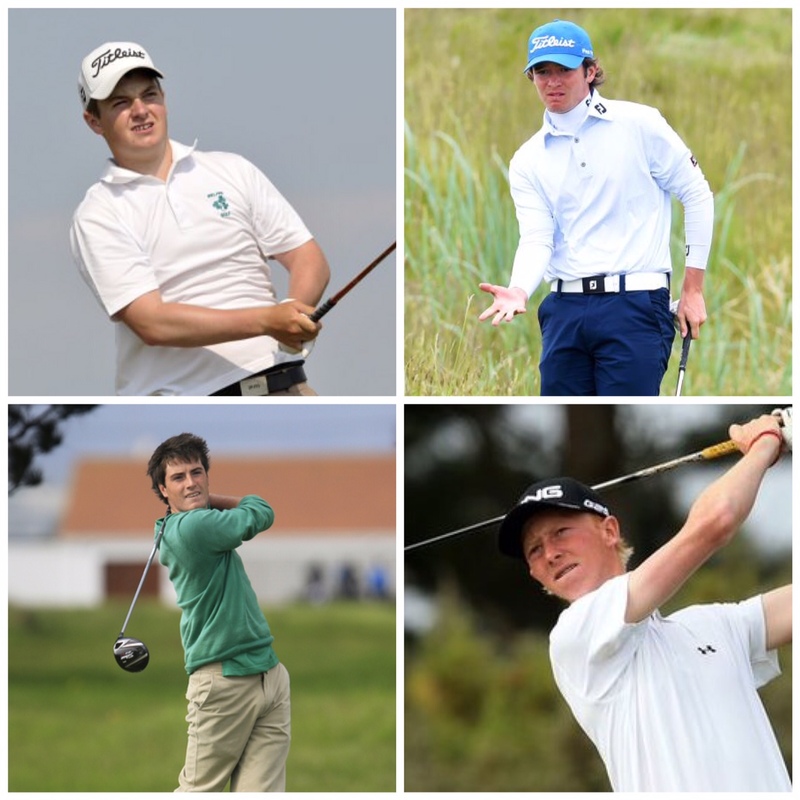 As always the Men’s Home Internationals, being played at Royal Portrush, and being fresh in the mind of the selector’s will be material to the final decisions. One thing writing this article has highlighted to me beyond doubt is that now we are getting to decision time picking the GB&I team is, I guess as always, not going to be straight-forward. There maybe some surprises and disappointments come August. * The SPWAR and WAGR used in this article were correct as at 11th July 2015 and 8th July 2015 respectively.